The Supersaurus meaning ‘super lizard’ was discovered in Colorado in the Upper Jurassic Morrison Formation in 1972, and was officially named by Jim Jensen the Supersaurus vivianae in 1985. A member of the Diplodocid family these sauropods were a group of dinosaurs which comprised of some of the largest species ever to exist. In terms of height and weight these dinosaurs were big, but what was fascinating about them was their massive length. Being a part of the Diplodocid family we already know the Supersaurus was a 4 legged herbivore with immense proportions but other common features include an extremely small head, pegged teeth and of course an extremely long tail to counter balance its massive neck. Fossil remains suggest that the Supersaurus could reach lengths of up to 115 ft, and a weigh up to 35 to 40 tonnes. The problem with the Supersaurus fossil discovered in 1972 was that only a few specimens from the neck vertebrae and the shoulder girdle were found. These evidences are enough to determine the massive extent of its size as well as certain basic characteristics but other than that all other characteristics had to be borrowed from other members of the Diplodocid family. Thankfully in 1996 an entire specimen of the Supersaurus was unearthed in Douglas, Wyoming which over time and much study will clarify and put to rest the various discrepancies and anomalies associated with the Supersaurus. 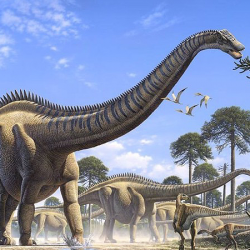 Despite having extremely long necks, according to new calculations Diplodocids like the Supersaurus probably couldn’t reach up as high as was first thought. In fact many scientists believe they were unable to lift their necks much higher than their shoulders, which would limit them to eating and browsing leafy twigs and low growing ferns. Despite a limit on lifting their necks, the extreme length they possessed would still have assisted them in grazing and finding food over large areas. This would suggest their ideal habitat may have been large open meadows and swampy marsh lands rich in greenery. The neck may have been great at searching and covering large distances but what about the equally long tail, what was that used for ? Well scientists have speculated that the tail which gets narrower and lighter towards the tip was probably capable of an extremely powerful whipping action which could have been used to snap at and ward off deadly marauders and predators. Taking this idea further some scientists believe the snapping action may have been powerful enough to produce deafening sounds which could have been used in defence, mating or even long distance communication.